The huge Aylesbury Estate is currently undergoing a major regeneration programme, addressing the problem of poor physical condition and the fact that nearly half of all residents feel unsafe walking through it after dark. By 2010, Southwark had produced an Area Action Plan and in 2012 sought a development partner to help rejuvenate the ailing estate. This was a rare opportunity to revitalise a part of London and to knit it seamlessly back into the surrounding city. Landscape played a pivotal role in reshaping the council’s AAP Masterplan. HTA recognised the importance of the site’s existing trees, mapped them onto the existing masterplan and reconfigured it, using the location of the trees to indicate where new roads and open spaces should go. This was a distinguishing factor in the bid and subsequent planning applications, and has added value to proposals in economic, environmental and cultural terms. 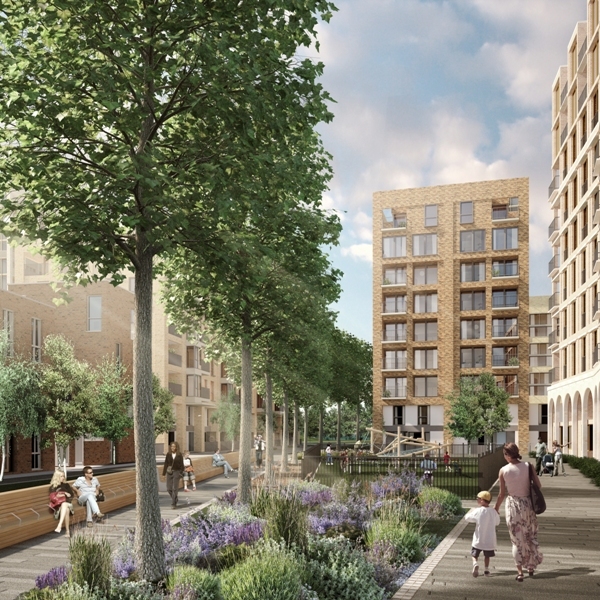 To develop a vision for the future of the Aylesbury Estate as set out in Southwark Council’s Aylesbury Area Action Plan (AAAP) SPD for one of the most ambitious regeneration projects in Europe. Creatine a revitalised, high density, urban neighbourhood that is connected seamlessly into the surrounding city, with safe streets, highly functional open spaces and great cycle access. The project regenerates 2704 existing homes to provide 3,575 mixed tenure and affordable homes. HTA Design’s masterplan creates a neighbourhood that promotes access to economic opportunity, social cohesion and healthy lifestyles through a network of connected open spaces and legible, highly walkable streets. 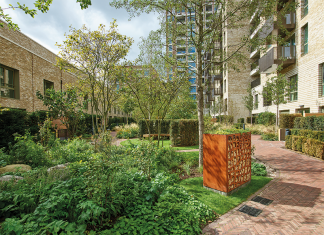 The vision describes the creation of a thriving new part of London knitted seamlessly into the surrounding city, with beautiful open spaces and some of the most spacious and light homes in central London. It is about creating a place that all Londoners, from every background, can make their home - a place that families will choose to bring up their children on safe streets and in well maintained parks, close to good schools and excellent job opportunities, right in the heart of London. Sustainable Drainage Systems (SuDS) is to be provided throughout the masterplan to reduce surface water discharge rates and improve water quality. The priority will be to collect, treat and store stormwater through measures that utilise green infrastructure and improve amenity. These are shallow planted depressions that attenuate surface water after rainfall events. The specially chosen plants and engineered soil remove pollution from the stormwater before it is discharged into the surface water sewer. The use of geocellular soil vaults under the paving provides further rooting volume for street trees and allows attenuation and treatment of stormwater prior to discharge. Within parks and open spaces, permeable surfaces such as grass, planting, self-binding gravel and other permeable surfaces will be used to increase infiltration of surface water runoff.